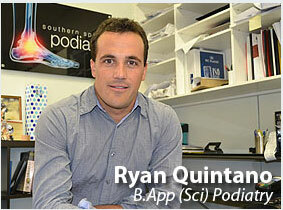 Thanks to Luke Bertram our Podiatrist and Cricket foot and ankle injury expert. Learn from Luke how your foot and ankle might hold up, or if you’re injured see Luke to help you return to play Sutherland 9521 7578. Cricket and particular fast bowling can be one of the most physically demanding sports you can play. The long periods spent out in the middle under the blazing Australian sun tests both your physical and mental fitness. 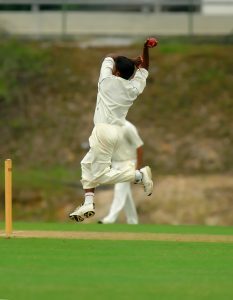 A fast bowler steaming in onto a hard wicket will apply a vertical force of 5-9 times their body weight through their front leg. When you consider that general running applies around 3 x body weight, this is a significant amount of force that needs to be absorbed somewhere. The natural shock absorbers of the lower limb being the foot, ankle and knee as well as the hips and the back further up the chain playing a role. This puts the lower limb at great risk of injury, particularly if your body is not full prepared to withstand the load. Lower limb injuries amongst fast bowlers even at the Test Match level are common. You only have to look at Mitchel Stark, Peter Siddle, Pat Cummins, James Pattinson and Mitchell Johnson to name a few to see that lower limb injuries for fast bowlers are very common and can put you out of action for an extended period. Heel pain- Due to high amount of force applied to heel when the front foot hits the crease the plantar heel may become injured. This can manifest in a variety of ways though Plantar Fasciitis, heel fat pad syndrome, bone bruising or bursitis. The pain can linger and way be uncomfortable after the completion of play as well as getting up from sitting or first think in the morning out of bed. Tendo Achilles pain: This is pain to the back of the heel and/or back of the ankle along the thick Achilles tendon which is the largest and strongest tendon in the body. Bowling loads as well as the quick movements required both in the field and at the crease can place high load on the tendon. If it is not prepared to withstand the load applied to it, then the it can become damaged. You may feel that the it is at its most painful during the first few strides then eases once you have warmed up. Footwear may also be a cause of pain to the posterior heel and Achilles, especially bowling specific shoes which can irritate and rub this area leading to pain. Posterior impingement syndrome: This is mostly seen as a result of long term issues or secondary to a significant trauma injury to the foot and ankle. Fast bowlers front foot will be prone to this injury over time as the torque the ankle has withstand moving into plantarflexion is very high. Pain will occur around the back of the ankle and can cause a restriction in range of motion. Often this pathology needs surgical correction but there are more conservative options available if it is picked up early. Pain around the knee: There are various injuries that can occur involving the knee including the patella (knee cap), patella tendon, ligament, meniscus, hamstring/quadriceps tendons, ITB ect. All require biomechanical analysis and loading management to achieve full recovery. Skin and nail: Blisters, callus and damaged nails can be just as painful and hindering to performance as a soft tissue or bone injury. The good new is that they relatively easy to manage both in the clinic and with footwear alterations.